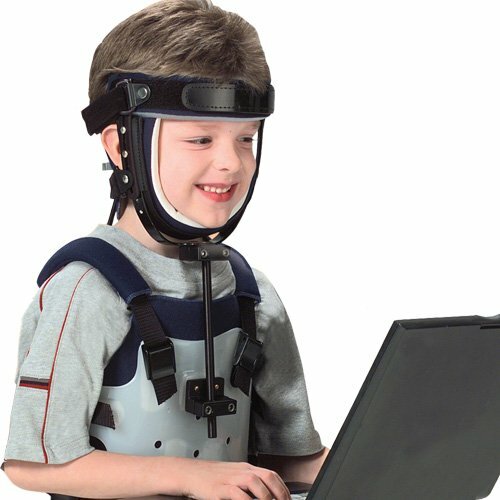 A pinless halo system for children has been developed by Max Lerman, CO and Larry Lerman CO, with the goal of providing cervical spine immobilization and control similar to a standard halo, but in a less invasive manner. The Lermam Noninvasive Pediatric Halo system is available in two, MRI compatible, fully adjustable sizes. The head is held in place with pads on the forehead and occiput. The system includes two back post options: rigid and semi-rigid. The semi-rigid back post option is designed for patients with congential muscular torticollis. The rigid back post option should be considered when additional restriction of cervical spine movement is required. Clinical Application: The Lerman Noninvasive Pediatric Halo System can be used in the management of a variety of pediatric cervical spine disorders. The noninvasive halo successfully controls rotation and lateral bending of the cervical spine and can be successful in positioning the head and neck of children with congenital muscular torticolis. Indications: Positioning of structurally stable spine, Following complications of standard halo immobilization, Postoperative positioning following sternocleidomasatoid release for congenital muscular torticollis, Reduction of C1-C2 rotary instability. Contraindications: Should not be used when immobilization of a structurally unstable cervical spine is required.